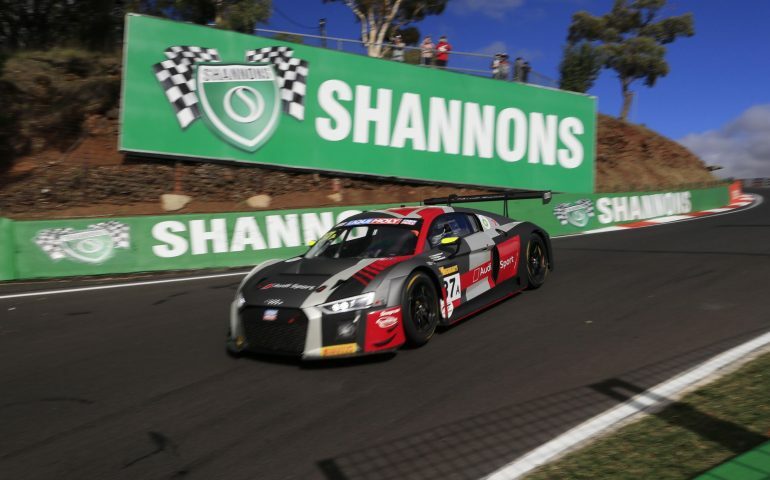 AUDI Sport Team WRT has claimed victory in the 2018 Liqui-Moly Bathurst 12 Hour with its #37 entry of Robin Frijns, Stuart Leonard and Dries Vanthoor after a horrific crash caused a red flag in the closing stages of the race. Coming home in second was the #75 SunEnergy1Racing Mercedes-AMG GT3 of Kenny Habul, Tristan Vautier, Jamie Whincup and Raffaele Marciello, while third was the #540 Black Swan Racing Porsche entry of Tim Pappas, Jeroen Bleekemolen, Luca Stolz and Marc Lieb. The WRT squad sat in the lead of the race into the final minutes when an enormous crash at the top of the Mountain ended the 2018 edition of the race early. Three cars were involved in the incident, including the #69 Supabarn Audi R8 LMS of Ash Walsh, #19 Mercedes-AMG GT3 of John Martin and the #95 MARC Cars Australia entry of Bryce Fullwood. Class A Pro-Am was taken out by the third place overall finishes Black Swan Racing, while the crashed Supabarn Audi won Class A Am, completing the most amount of laps in the class. Grove Racing took out the Porsche Class B victory with drivers Stephen Grove, Brenton Grove and Ben Barker, while Boost Mobile Class C was won by the #30 Boat Works Racing BMW M4 GT4 of Tony Longhurst, Aaron Seton and Matthew Brabham. The Racer Industries Invitational Class winners were the #91 MARC Cars Australia MARC II V8 of Keith Kassulke, Rod Salmon and Will Brown. “Yeah I mean everyone is ecstatic,” said Vanthoor. “It’s tough, rocking up the first time,” added Leonard. “Last year we didn’t have luck on our side,” said Frijns. “We came back strong this year. We didn’t have the radio for the first few hours. The last stint was fuel saving, so trying to keep the gap was tough. “It was pretty tough. There was a lot of traffic to keep the car in one piece is one thing, but to drive in the front is another thing. As the final hour began, the second placed #55 Mercedes-AMG Team Strakka Racing car of David Fumaneli dived into the pits to hand over to co-driver Lewis Williamson. Fred Makowiecki pitted on lap 259 out of the lead as expected to refuel the car and hand over to Romain Dumas with 45 minutes remaining, leaving Frijns in the #37 WRT Audi out front from Whincup in the #75 SunEnergy1Racing Mercedes and Earl Bamber aboard the #991 Craft-Bamboo Racing Porsche. Moments later, the #11 Objective Racing McLaren of Warren Luff dropped out of the race, retiring with a starter motor problem in its last pitstop. It was the crash between the #69 Supabarn Audi, #95 MARC car Fullwood, #19 Giffith AMG John Martin that marred the end of the race, with race control calling a red flag.